Solstice Scents' Spring Collection release will be live tonight at 7 p.m. EST at www.solsticescents.com. An at-a-glance list of what will be available is provided below. Full fragrance descriptions for the spring scents is below the list. All of the perfumes will be available in the 1 ml vials in the sample packs and the free sample at checkout except for Estate Vetiver, which is an EDP exclusive and only able to be sampled in the 2.5 ml sample spray listings. New customers: EDPs are not available in the sample packs. This includes EDP exclusive scents such as Estate Vanilla, White Feather, etc. WINTER COLLECTION AND VALENTINE'S COLLECTION is no longer being restocked. Listed inventory is all we have available for purchase. 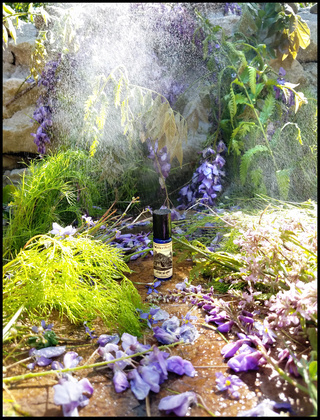 After the Rain is a natural perfume in organic cane sugar alcohol featuring notes of lilac, purple wisteria, blue lotus absolute, rain, new green leaves, wild violets, soil, clary sage and more. After the Rain is a lilac-heavy fragrance with green and petrichor top notes. This perfume celebrates the eruption of blooms that occur after the spring rains. It is a cool-tone purple floral with delicate rain drops clinging to the velvet petals and lush green leaves. The rain accord comes through as the scent of rain left after the storm has passed, rather than the strong eruption of petrichor that explodes as soon as the rain begins to fall. It is a cool, wet, misty impression that hovers around the bold lilac, wisteria and peaceful blue lotus absolute. The wild violets are subtle and meld with the bolder floral notes rather than standing our like in our violet focused perfumes. The green elements are carefully restrained and primarily detectable along with the rain top notes upon initial application. After the Rain feels romantic, Victorian, haunting, mysterious and elegant. It conjures visions of being in the English countryside in a stone cottage covered in wisteria vines. The leaded glass window has been left open to allow the cool rain-tinged air and the scent of florals and greenery to waft in. A touch of cool wet earth remains into the dry down, just behind the flowers. Available as 5 ml alcohol based roll on, 60 ml EDP and 2.5 ml EDP sample spray. A lilac heavy Whipped Soap called Garden Gate will be available. Cameo is a delicious gourmand fragrance blended with rose. Almond, rose, yellow cake, tonka bean absolute, coconut flakes, creamed ginger and a light top note of bitter red orange EO combine to create a sweet feminine floral. 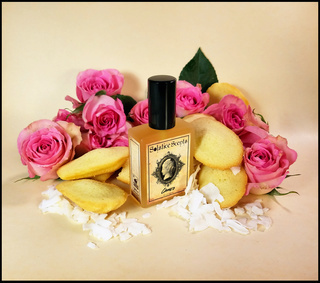 The almond is dominant on cold sniff and initial application, followed by rose. As Cameo settles on the skin, the almond smooths out and the tonka bean comes to the foreground. The coconut flake and yellow cake emerge and meld with the tonka and the light zing of creamed ginger. The rose and almond become very soft and well blended with the rest of the notes. The orange is a top note that does not linger in the final composition. Cameo contains a blend of fragrances, Moroccan rose absolute, tonka bean absolute, ginger CO2 and bitter red orange essential oil. Chantilly Cream has a profile that is very light, sweet and delicate. It hugs very close to the skin and is intended for a gentle skin sweetening treat when you wish to wear something a little lighter and less heady near those sensitive to fragrance, in the work environment or just because you want to indulge in something a little softer in scent and throw. It is a versatile scent that would pair and layer wonderfully with fragrances in your collection that contain notes of coconut, cake, fruit, vanilla or even select floral scents (white florals such as jasmine, tuberose and lily especially). DO NOT APPLY IMMEDIATELY AFTER A HOT SHOWER OR NEAR CUTS OR BROKEN SKIN AS LIKE LEMON JUICE, LEMON MYRTLE MAY STING. Chiffon is a dual concept fragrance that brings together the airy, sweet and refreshingly tart taste of Lemon Chiffon pie and the elegant, wispy and equally airy beauty of chiffon fabric. A very special top-shelf, perfectly sweet and non-cloying vanilla (one of the vanillas in Nightgown) provides a base for a delicate touch of white amber and white musk. Chiffon is completed with the bright and uplifting scent of pure lemon myrtle essential oil. The lemon myrtle is one of the dominant notes on cold sniff and initial application. It will recede within 5 to 10 minutes and allow the other notes to emerge. Unlike most lemon essential oil top notes that disappear fairly quickly, lemon myrtle EO has a strong lemon-like scent but also a very good staying power. Lemon Myrtle is distilled from the leaves of a native Australian Tree. As it fades and takes a back seat to the other notes a wonderful, sweet, ethereal and beautiful long-lasting scent is left behind.The longer Chiffon is on the skin, the sweeter it gets. The vanilla is the longest lasting note of the blend and takes on a glorious whipped cream and an almost marshmallow note the longer it is on the skin. A really lovely and sophisticated scent! Fans of some of our other scents like Nightgown, Snowshoe Pass and Manor should really enjoy Chiffon. Devil's Millhopper is a unique geological formation that is 120 ft. deep and 500 ft. across at the rim. It has over 230 steps descending into its heart. The sinkhole's name comes from its funnel-like shape which resembles a grist mill's hopper in which grain was held. Early settlers found fossilized animal remains and shark's teeth at the bottom and along the craggy walls leading them to believe that this was the place where bodies were fed to the Devil. Devil's Millhopper has a lush primitive environment with fern, moss, lichen, rare plants and a variety of trees. There are several small caves and waterfalls which flow into the basin below. The water then travels to an underground river which leads to the Florida aquifer. This scent contains notes of heather, oakmoss and an assortment of woods used to interpret the atmosphere of Devil's Millhopper. On cold sniff it smells of fern, new spring leaves, moss and grass with heather and soft woods lurking just below. It is not foresty or heavy on the wood notes, despite the variety used. It smells fresh, green and (purple) floral and hugs close to the skin on the dry down. On initial application, the green top notes quickly subside and the fresh cool-toned floral note of heather and delicate woods emerge. Dry down is soft, fresh and hugs close to the skin. A very unisex scent. One of our simpler blends of heather, African bluegrass EO, hinoki wood EO, oakmoss absolute, ho wood EO, sandalwood, rosewood EO, Virginia cedarwood EO & muhuhu EO. The purple floral, fresh and green top notes stand out the most. Strong on initial application. Dries down relatively linear as a fresh floral and hugs a little closer to the skin. This perfume is for vetiver and patchouli lovers. Loads of organic vetiver from Haiti, a touch of vetiver from Sri Lanka, a heavy dose of smooth aged patchouli, sustainably harvested sandalwood EO with a top note of tobacco leaf and a very light touch of lime peel all atop of our house vanilla, Estate Vanilla. This primarily natural base-note-heavy perfume is perfect for those looking for a dirty vanilla and who love vetiver. On initial application, the tobacco leaf is present and slightly dank but does not last long before it gives way to an explosion of sweetened vetiver and patchouli. Estate Vetiver is the 4th in our Estate Series. It layers well with so many of our other perfumes as well. Whipped Soap only. If you're looking for a lilac heavy perfume, try After the Rain. Gin Flower is a delicious natural perfume in organic cane sugar alcohol. This is based off a gin and St. Germain elderflower liqueur cocktail and is the first in a series of cocktail perfumes. Elderflower liqueur tastes like nectar. It is a sweet liqueur with notes of pear, apricot and honey. Gin Flower is sweet, lightly fruity, fizzy and zesty scent with loads of osmanthus flower absolute. Osmanthus, also known as tea olive, has a strong apricot-like note. It is more fruity than floral and also has the faintest leather note to it. Osmanthus and apricot are the strongest mid to base notes along with a large dose of vanilla and subtle traces of organic Hawaiian sandalwood. The top notes are juniper berries, which give gin it's distinctive flavor, lime zest and juice and citron. Gin Flower also contains a special elderflower accord made with tons of elderflower CO2, pear, manuka honey accord (vegan) and apricot. On initial application, you will smell a burst of a gin and tonic due to the juniper, lime and citron notes. These are short lived top notes that give way to the generous saturation of osmanthus, vanilla and elderflower. Gin Flower develops quickly and becomes fairly linear but retains a slight zest along with the sweet and fruity apricot/osmanthus. The combo is mouthwatering and uplifting. As a natural perfume, longevity is a bit shorter than our mixed media or synthetic perfumes. After the initial opening, the perfume will wear a bit closer to the skin with a more intimate throw. It does last for several hours and it does waft from the skin. It will continue to get stronger as it ages in the bottle so the scent will be even more concentrated/strong months from now. For best results, apply very generously with a few layers (apply, let dry, apply more to the same spot. Do this a few times) and it will last surprisingly long for a natural! The performance is even better on clothing when sprayed in a layered format in the same spot. This perfume is best experienced in spray format but is being offered for convenience to those who prefer roll ons. Inspired by the scent of budding spring in the meadows of the Appalachian mountains, Mountain Vanilla is a coumarin-heavy scent with vanilla and light green elements. The spring air smells strongly of coumarin, specifically the scent of wild sweet clover (the white flowers pictured), along with a cool morning dew and light green notes. It also carries a scent reminiscent of carrot flowers. 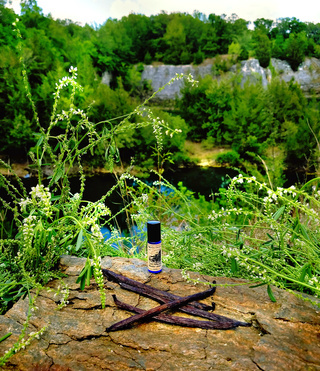 Mountain Vanilla focuses heavily on coumarin rich notes such as sweet clover absolute, deerstongue and Bulgarian Lavender absolute (used lightly. This is not a lavender perfume) paired with vanillic Chinese Silk vine, vanilla, vanilla musk, poplar bud absolute, tonka and elderflower (elderflower smells like a heavenly nectar of fruit and Manuka honey. It's not particularly floral, more of a nectar scent). Top notes include a green accord of shiso leaf, fern, green clover and bluegrass along with a trace of cool morning dew clinging to the green shoots. The dry down features primarily vanilla and coumarin. It's a very sweet, creamy perfume with subtle green nuances. 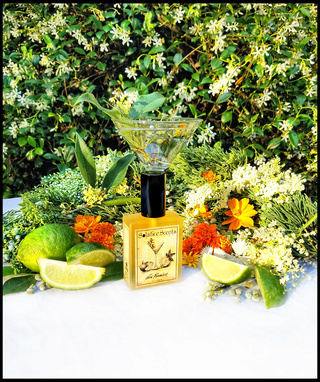 Mountain Vanilla is an alcohol based mixed media perfume. The night breeze laced with the essence of jasmine, tuberose and ylang ylang, caressed by whispers of vanilla orchid, white amber, coconut and sandalwood blended with a light base of Edge of the Night* and amber. The result is a very creamy, velvety white floral with a subtle sensual depth provided by the amber and Edge of the Night. The white amber adds a fresh clean note, the vanilla orchid and coconut sweeten and the sandalwood rounds out the edges. 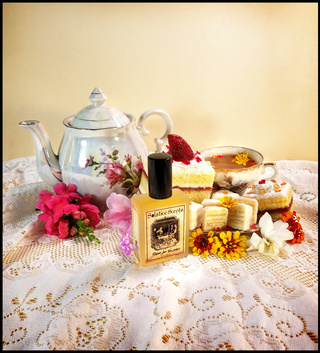 Whispers in the Night is inspired by the stage of spring in the south when the confederate jasmine erupts, perfuming the air with the sweetest and most delicate intoxicating floral notes. *The notes in the Edge of the Night base for this fragrance include: amber, oakmoss, aged patchouli, bergamot, black vanilla, red musk, buddha wood, organic clove EO, star anise EO, cinnamon and a nominal amount of lavender absolute and agarwood.